That was quite a circus, getting to ask questions (text below) to the Shell board at their Annual General Meeting. By proxy, mind you. Charles Holliday (chairman of the board of directors) answered. 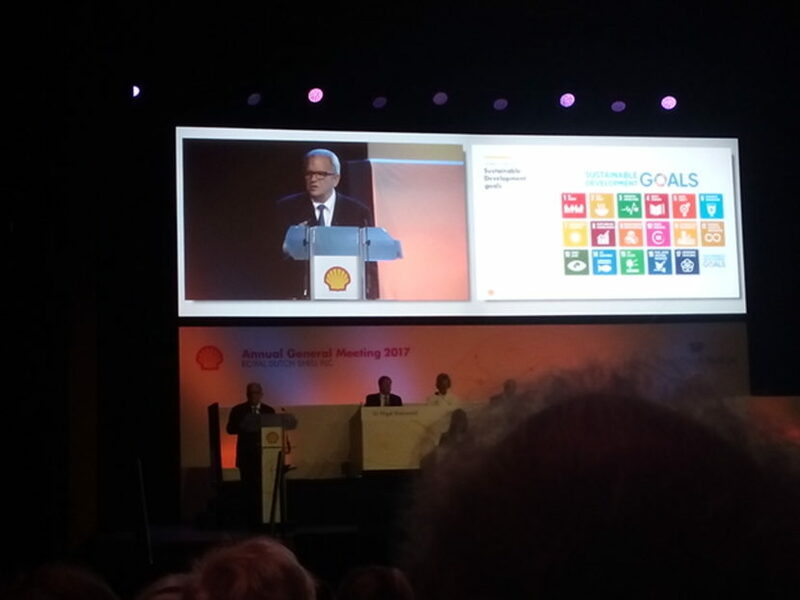 He tried to cut it short and we perfectly understand why: this is the Achilles’ heel to Shell’s “we aligned our business to Paris/the world needs us to reach the Paris-goals”-talk. And thus the Achilles’ heel to their business model. My name is Femke Sleegers, I’m with The Hague Fossil Free and I have a question regarding your gas strategy. Now that it’s acknowledged that gas is at least just as bad as fossil fuel as coal and oil. What are the implications to your gas strategy? Maybe we should call gas for what it is: methane. Methane is one of the most dangerous greenhouse gasses. Methane traps 86 times more heat than CO2. Because it is so potent, only a small amount of methane leakage – 1 to 3% – will make gas as bad as diesel and coal. Unfortunately, gas does leak more than 3%. A review of more than 200 studies, by Stanford University, confirms an average methane leakage of 5.4%. That’s almost twice as bad for the climate as coal. At some sites gas leakage was around twelve percent. That’s 4 times as bad as coal. This numbers are from the US. Do you think it’s any better in Russia, Iran or Irak? You claim methane is the solution to climate change. You claim methane is a bridge fuel. Really? A gas eighty-six times as bad as CO2? Are you sure about gas? Are you convinced you do what’s best for your future as a company. For our future, as humanity? What if you are wrong? You say you have aligned your business to the Paris Agreement. You say you mind climate change. If you do, don’t tell us. Show us. Show us, by moving straight to the sun, the wind and the water. Before the sun – by global warming -, the wind – by extreme weather events – and the water – by sea level rise – move us. My question to the board is: in your businesscase for gas, do you take into account an average methane leakage of 5,4% and a global warming potential of 86 to 106 that is relevant for the 1,5C goal of the Paris Agreement? After the board reassured me everything is being taken care of, I asked another question. Read more about methane leakage (apart from the links in the speech) in The Guardian. And this article on Think Progress sums it al up. Shell is well aware of methane leakage, but estimates its own leakpercentage conveniable low. 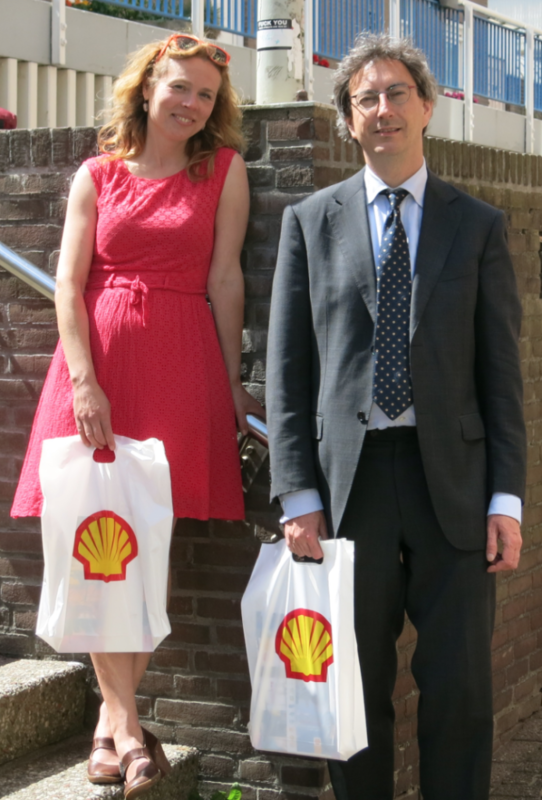 Femke Sleegers (Den Haag Fossielvrij) en Joeri Oudshoorn (Haagse Stadspartij) met goodiebag na afloop van Shells AGM 2017. Joeri had een vraag gesteld over de werkgelegenheid in Den Haag. Den Haag is erg afhankelijk van de werkgelegenheid in de olie- en gasindustrie. Maar die sector gaat niet samen met klimaatbeleid. Krijgen werknemers al omscholing aangeboden?